Having a full household is usually a chaotic, busy affair… but never more so than after the quiet summer months wane and back-to-school arrives. While it can be fun to start new activities and re-establish comfortable routines, the growing pains of starting the new school year almost always require a little forethought and preparation. That is, if you want to come out unscathed. Maybe. One small but profound time saver is the prepping of school lunches. Not only is it a money-saver, but for parents with celiac or gluten-intolerant children, it can be one of the surest ways to guarantee good health during the school year. But all too often we forget to go shopping, or to pack the night before, leading to unbalanced food choices, more processed additions, or the need to buy something potentially contaminated on the way to or at school. Ease your way into autumn with a few resources! We compiled some of our favorite recipes and tips to get you off on the right foot. And one of the best parts? We included some healthy work week lunches for you too. Let’s do this! Are you a parent sending your child to school for the first time after receiving their gluten-free diagnosis? Let’s cover a few bases. Although we’re talking about homemade lunches, legally schools are required to make reasonable accommodations for children with celiac disease under the Americans with Disabilities Act. 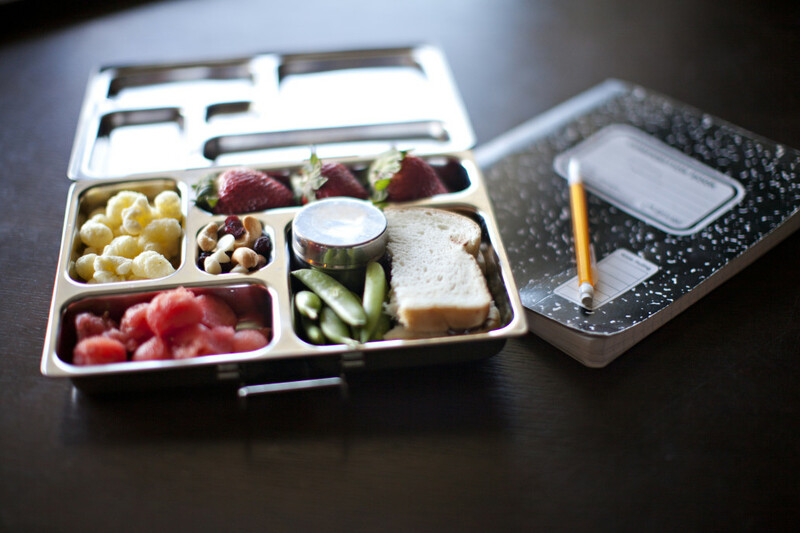 It is well within your rights to ask that healthy snack alternatives and lunch options be made available, even if you intend to send your little one with a homemade meal each day. You never know what circumstances will arise, so being prepared for the eventuality that they will need to access school foods at some point is key. To help you empower your school-age kiddo and communicate with teachers, we wrote a blog post filled with First Steps For the Classroom and Beyond – resources, printables and talking points included. Ready to eat? Once you have food safety basics covered with the school itself, it’s time to get your meal-making plan on track. For starters, if you’re short on time or aren’t yet well-versed in crafty gluten-free substitutions, don’t panic: there are plenty (and we mean plenty) of naturally safe food combinations to choose from. The key is making sure you hit all the nutritional high notes while still keeping it fun, interesting and inclusive of the occasional treat. This list of 40 Gluten-Free School Lunches by Paleo Mama is designed to be simple, natural and get you through the first couple months of busy adjustment. One of the best things about this menu is that it’s not only comprised almost entirely of no-cook food items (cheeses, veggies, sliced deli meats) but it’s also foods you would find yourself eating too. No overly processed, “designed for kids” food here! Put ‘em on the path to eating whole foods as early as possible… and you too, while you’re at it. If you are willing to do some light baking and other stovetop prep, these 20 Gluten-Free School Lunch Ideas are where it’s at. From grain-free meatballs to coconut flour pumpkin spice muffins, this list hits all the high notes. And we mean all – blogger The Darling Baker makes sure she includes one of every macro nutritional checkpoint in her kids’ meals: Good Fats, Quality Protein, Seasonal Produce, A Source of Vitamin k2, Bone Broth and Fermented/Cultured Foods. For ideas that touch on more of the comfort food classics, check out this post from What Lisa Cooks: a compendium of grain-free lunch recipes that includes Quinoa Mac ‘N’ Cheese and Gluten-Free Mini Corndogs. You may have noticed that all the best gluten-free lunch lists include photos of perfectly portioned meals arranged in compartmentalized lunch pails that make even basic PB&J look like a chef-prepared Bento Box from Nobu. While enviable, this may seem like overkill. But wait! There’s a logic behind the madness and it is this: not only are specialized containers a good investment simply because they allow for more adept portion control, but food that looks cute is more likely to get eaten. Like they’ll tell you in any restaurant: eating starts with the eyes, and there’s just no substitution for attention to plating. In shorthand, this means that if you want your kiddos to make short work of their fruits and veggies, make ‘em look too adorable NOT to eat. And lastly, if your child is old enough to start tackling some (or all) of the lunch prep, let them! It’s not only a fantastic way to engage them in making healthy choices, but they’ll be more likely to eat what they pack themselves. This article has some healthy tips on having conversations about nutrition, jump-starting a lunch-making routine, and a printable chart that helps young chefs choose balanced elements for every meal. As we mentioned earlier, some of these ideas don’t have to be for the kids. If you want to eat healthier and save money, getting in the habit of making your own lunches is key. And if you’re going to be making the kids lunches anyway, why not take a little time for yourself too? These 8 Bring-to-Work Lunch Ideas are heavy on the healthy fats and protein, so you stay full longer. We also love this list of Gluten-Free Meals to Pack In Your Lunchbox from The Kitchn. It incorporates creative flavors from around the world while keeping prep time low. Plus, many of the dishes are just as good hot or cold! Feel ready to take on the school year? You look like it. Happy lunching!